BEIRUT – Turkey’s foreign minister demanded yesterday that the Syrian government end its crackdown on a five-month-old uprising “immediately and unconditionally,’’ warning that unspecified steps would be taken otherwise. 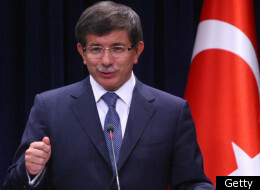 The comments by the minister, Ahmet Davutoglu, who visited the Syrian capital, Damascus, just last week, were the latest addition to a semantic exercise in diplomatic ambiguity, as the United States, European countries, Turkey, and Syria’s Arab neighbors have sought to condemn the violence while giving President Bashar Assad the chance to change his response to the protests. The Syrian government has ignored the condemnations. Just days after the visit by Davutoglu, who says he has visited Syria more than 60 times, the government sent military and security forces into the port of Latakia, the third city to fall target to a crackdown that activists say killed 260 people this month. Since the beginning of August, government forces have retaken control of Hama, in central Syria, and Deir al-Zour, in the east, both of which witnessed demonstrations by hundreds of thousands of people earlier this summer. In Hama, a Western official said security forces used antiaircraft guns against civilian buildings. The same tactic was used in Latakia over the weekend, activists said, as well as gunfire that originated from ships off the coast. The Syrian government denied that ships fired at Latakia. Activists say 31 people have been killed since the beginning of the Latakia assault. “This is our final word to the Syrian authorities: Our first expectation is that these operations stop immediately and unconditionally,’’ Davutoglu told a news conference in Ankara, Turkey. “If the operations do not end, there would be nothing more to discuss about steps that would be taken,’’ he said, without saying what that action might include. Diplomats have said that they believe Turkey, during Davutoglu’s visit with Assad, gave the Syrian government two weeks to introduce sweeping changes. The precise nature of those changes remains unclear, but the window came amid a flurry of conversations between President Obama, Prime Minister Recep Tayyip Erdogan of Turkey, and King Abdullah of Saudi Arabia. No less apparent are the Syrian government’s intentions. It has continued to insist that it is facing a rebellion by armed Islamists funded from abroad. It described the violence in Latakia, where the crackdown began Saturday, as an issue of security forces pursuing men armed with machine guns, grenades, and explosive devices. Some analysts have criticized Davutoglu’s visit to Syria, arguing that it only bolstered the credibility of the Syrian government at the very time the United States, European countries, and others were trying to isolate Assad’s leadership. The escalation in violence seems to have embarrassed Turkish officials, who had only last week urged at least a measure of patience in seeing whether Assad would act. The Syrian military and security forces pressed on with raids in Latakia yesterday, especially on a southern neighborhood inhabited by Palestinian refugees and poor Syrians, but the violence appeared less pronounced than over the weekend.